Independent-minded music is usually realized as a reaction to something. For Arnold Schoenberg it was World War I, for Roger Waters it was the death of his father and for Redshift (James Goddard, Rob Jenkins, Julian Shreeve and Mark Shreeve) it is tomorrow; a tomorrow where music is stored and experienced digitally, unchanging and perfectly intact... its humanity vanquished. Their albums Oblivion (53'20") and Faultline (74'20") are a fable from the future, refracted in modern skepticism. One, a studio album which vibrates with restrained intensity, the other energized by the ritualistic nature of the live performance, are characterized by their breakthrough in tone, elegance and complexity of intentions. These works derive their magnitude from the unresolved tension between old and new music technology and consciously evoke a bygone day of musicmaking. 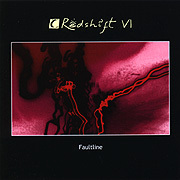 At its most potent Redshift delivers a range of strident electronic rhythms. From resolute and propulsive syncopated pulses of tone to the metronomic, mesmeric cadence of cycling sequencer patterns, the motifs and arrangements are rhythmically intricate and meticulously woven. This brand of Spacemusic demands attention. The raw intensity is riveting and offers little time to drift off in contemplation. As space will change shape by twisting, expanding and warping, so then does the music, eventually arcing downward into fantastic passages of enharmonic timbres and nonspecific washes of sound. 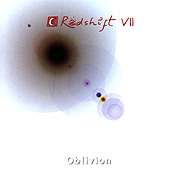 Redshift puts forth a level of craft as opposed to pure mechanistic message and takes this music to the edge of possibility. Spacemusic's most unique attribute is that it changes, and is experienced, over time. On these albums, imagination finds form in sound. Somehow, amidst all the technology, the creative spirit rises. Influence can always be measured easier than greatness. Redshift fights the notion that this music belongs to history rather than the present. It's more than a continuation of a lost tradition; Spacemusic is an art, a mode that is inexhaustible.